a collection of fibers or strands, as of muscle fibers or nerve fibers. See also tract and fasciculus. atrioventricular bundle bundle of His. fundamental bundle (ground bundle) that part of the white matter of the spinal cord bordering the gray matter and containing fibers that travel for a distance of only a few segments of the cord. bundle of His a band of cardiac muscle fibers connecting the atria with the ventricles of the heart; called also atrioventricular bundle. Bundle of His considered as the trunk of the bundle and excluding the bundle branches. From Dorland's, 2000.
medial forebrain bundle a group of nerve fibers connecting the midbrain tegmentum and elements of the limbic system. Thorel's bundle a bundle of muscle fibers in the human heart connecting the sinoatrial and atrioventricular nodes. 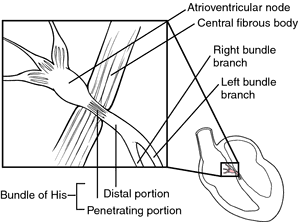 the bundle of modified cardiac muscle fibers that begins at the atrioventricular node as the trunk of the atrioventricular bundle and passes through the right atrioventricular fibrous ring to the membranous part of the interventricular septum where the trunk divides into two branches, the right bundle [TA] (crus dextrum [TA]) of the atrioventricular bundle and the left bundle [TA] (crus sinistrum [TA]) of the atrioventricular bundle; the two crura ramify in the subendocardium of their respective ventricles. The bundle of cardiac muscle fibers that conducts the electrical impulses that regulate the heartbeat, from the atrioventricular node in the right atrium to the septum between the ventricles and then to the left and right ventricles. Also called atrioventricular bundle. A bundle of specialised cardiac muscle fibres which carries the electric impulses for the co-ordinated contraction of the heart. The bundle begins at the AV node located at the inferior interatrial septum, and passes into the subendocardium through the right fibrous trigone to the interventricular septum, after which it divides into right and left limbs that pass along either side of the septum, branching to the walls of the ventricles. The short bundle of specialized heart muscle fibres that conducts electrical impulses from the ATRIOVENTRICULAR NODE to the conducting bundle that splits at the top of the interventricular septum. Also known as the atrioventricular bundle. (Wilhelm His, 1831–1904, German professor of medicine). a group of specialized muscle fibres in the mammalian heart carrying electrical signals from the ATRIOVENTRICULAR NODE down the septum between the ventricles and eventually dividing up into Purkinje fibres. See HEART and Fig. 189 .
a collection of fibers or strands, as of muscle fibers, or a fasciculus or band of nerve fibers. a large muscle bundle between the right and left atria, thought to serve as a specialized conduction pathway. that part of the white matter of the spinal cord bordering the gray matter and containing fibers that travel for a distance of only a few segments of the cord. Called also ground bundle. a band of atypical cardiac muscle connecting the atria with the ventricles of the heart; called also atrioventricular bundle. associated with sudden unexpected death or periods of viciousness; most common in Doberman and German shepherd dogs. inherited in Pug dogs; associated with syncope and sudden death. a bundle of fibers in the wall of the atrium of the heart between the venae cavae. a group of nerve fibers connecting the midbrain tegmentum and elements of the limbic system. a bundle of muscle fibers in the human heart connecting the sinoatrial and atrioventricular nodes. the sharply bent bundle that connects the frontal lobe of the brain with the temporal and occipital lobes. a band of fibers from the mamillary body to the anterior nucleus of the thalamus.